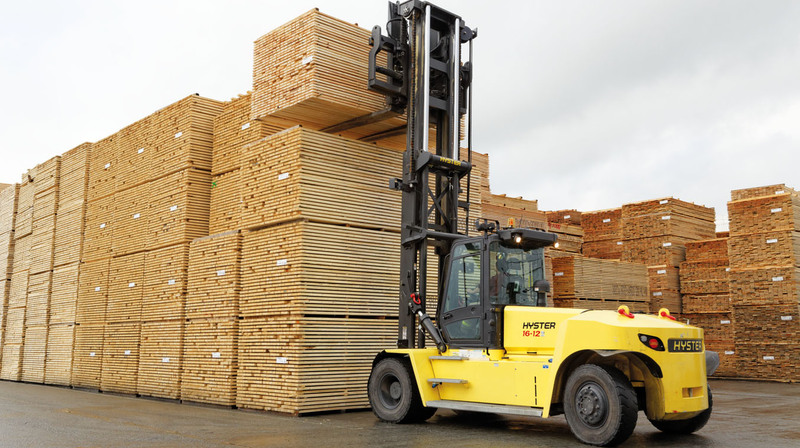 Hyster has a long and successful association with the timber industry. Our reputation for reliability in difficult working conditions continues today – almost 100 years since our early models were designed specifically to work in this industry. The comprehensive Hyster® range is ideally suited to meet the various requirements of this demanding industry from timber to palletised packing and all other derived products. From tough Big Trucks to smaller Electric Lift Trucks and Warehouse Trucks for efficient operation in intensive storage density areas. Trucks can also be tailored to your specific requirements with a wide range of specialist attachments. 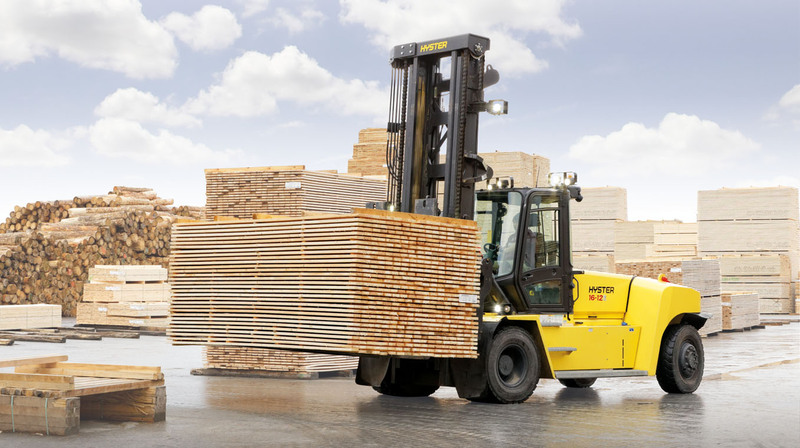 Why choose Hyster® lift trucks for wood handling? Trucks need to work in and travel between many different areas (inside /outside / concrete floor / dirt floor) so operator visibility is important for effective operation. The air intake and exhaust are positioned on the counterweight to help keep operator sight lines clear. The Hyster® Vista Cab (available throughout the Heavy-Dut Lift Truck range at 8T and above) is designed for optimal visibility. Dirt, dust and extreme weather provide one of the harshest environments for a forklift. With superior cooling properties and optimum temperature controls for the engine and hydraulic oil, Hyster® lift trucks are designed to operate effectively whatever the challenge. Fuel efficiency levels on these hardworking trucks help keep your cost of operation down. Hyster® forklifts are designed for use in a fast moving 24-hour environment, efficient use of the truck is maintained with fuel saving features throughout the range. 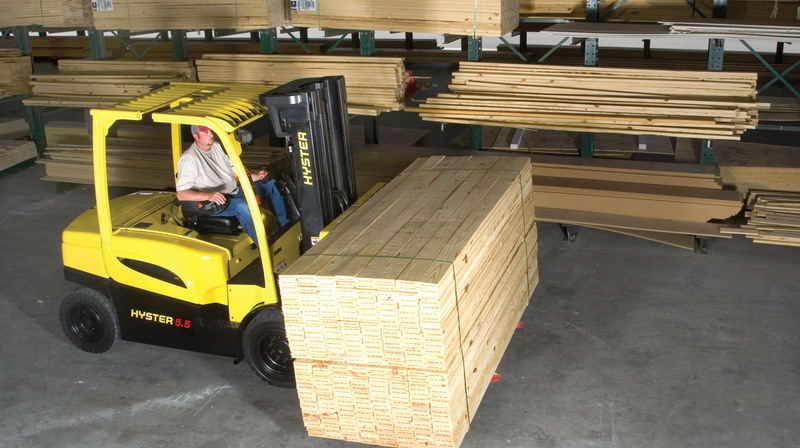 The operating environment in timber materials handling involves the challenges of weather, rough and uneven surfaces, dust and dirt, both inside and outside operations – Hyster® lift trucks are designed to cope with the whole range of environments with ease. Operation in harsh environments is aided by superb air cooling and oil control systems (hydraulic/engine). 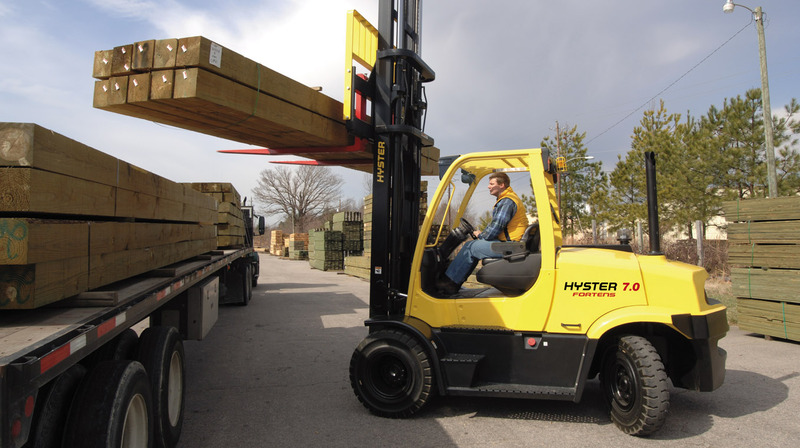 Ergonomics are a priority on Hyster® lift trucks. The operator is subjected to many outside influences (noise/vibration/weather/dust) so the superb ergonomic design of the operator compartment helps to increase driver comfort and maintain productivity. Ease of servicing is essential in intense working cycles and by utilising smart engine technology and industry leading components, maximum uptime levels are achieved. The timber industry is a harsh operating environment in which durability is a key requirement for materials handling equipment. The reputation of Hyster® lift trucks for reliable and effective operation in this arena is based on decades of service in the timber industry. Space is at a premium in timber yards, and the manoeuvrability of Hyster® lift trucks comes into its own, combined with ease of operation. Inbuilt manoeuvrability is designed to help exceed timber yard requirements. A wide range of specialist attachments is available to help make a Hyster® lift truck efficient from the saw mill to the drying kiln and beyond. Telematics can be fitted to monitor and provide engine management, for optimal efficiency and productivity levels in your operation. To monitor and ensure performance levels, use the Hyster Tracker telematics system. Hyster has developed an electric option well suited to arduous applications. The longer wheelbase Hyster® J5.5XN electric forklift extends the capability of the series more effectively than simply increasing the lifting capacity. The Hyster® H16XM-12 forklift (Stage IV) powered by a Cummins diesel engine delivers core Hyster® toughness and dependability for use in the timber Industry. The full range of Hyster® lift trucks provide durability particularly in harsh working environments, and have a long history of effective operation in the timber industry. Visit www.hyster.eu to discover more or speak to your local Hyster® distribution partner. This entry was posted in 360-degree benefits, Attachments, Big Trucks, Counter Balance, Fuel Efficiency, Hyster, Hyster Europe, Intensive Applications, Multi Tool Changer Attachment, Solution, Telemetry, Wood Sector and tagged Attachments, Counter Balance, Durability, Ergonomics, Fuel efficiency, Hyster, Hyster Europe, Innovation, Manoeuvrability, Telemetry, Wood Sector. Bookmark the permalink.